Some where along the way I heard a parenting tip: say ‘yes’ more than you say ‘no’. I have really taken this to heart and fully believe in the theory behind it. For example, I have a friend that was saying “no” to simple things like when her child would ask for an apple right after lunch. There is no harm in having an apple. Parents need to say “yes” to the simple things so that when we say “no”, the kids know that we really mean it. Of course my kids will still try to persuade me but they know that I will typically stick to my guns because I don’t say “no” too often. On some topics they know to ask Daddy first, especially when it comes to eating sweets or getting a treat. He likes to spoil them in that way and I always thinks about what’s in the treat and always say “no”. It’s my thing. 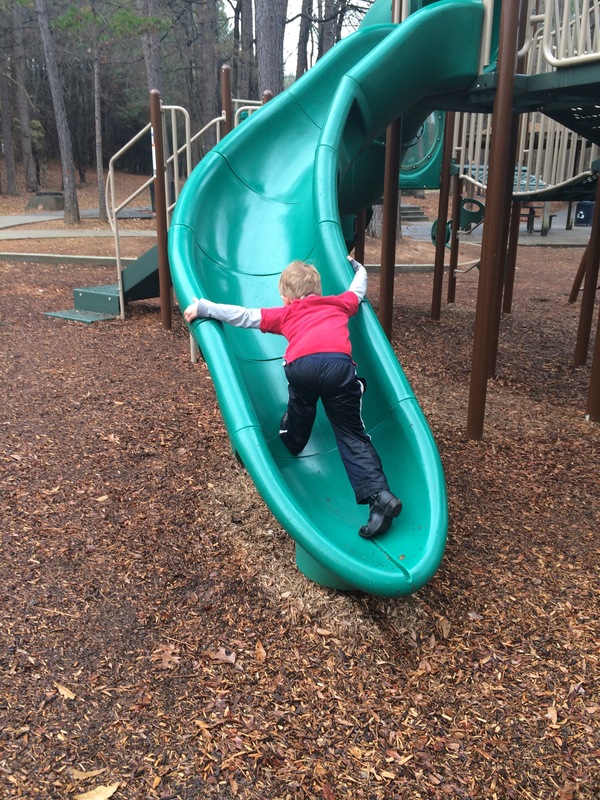 I said yes to wet slide…. I picked wilson up from school after it had rained all morning. He asked me if we could go to the playground next to the school so that he could “go down a water slide”. He was asking if he could go down the slides that were full of water at the playground. I wanted to say “no”, but thought that there was really no harm in him getting cold and wet if he was having fun. So I said “sure!”. He went down every slide, got soaked, had fun, and we went home to take a warm bath. Totally worth the extra effort on my part. 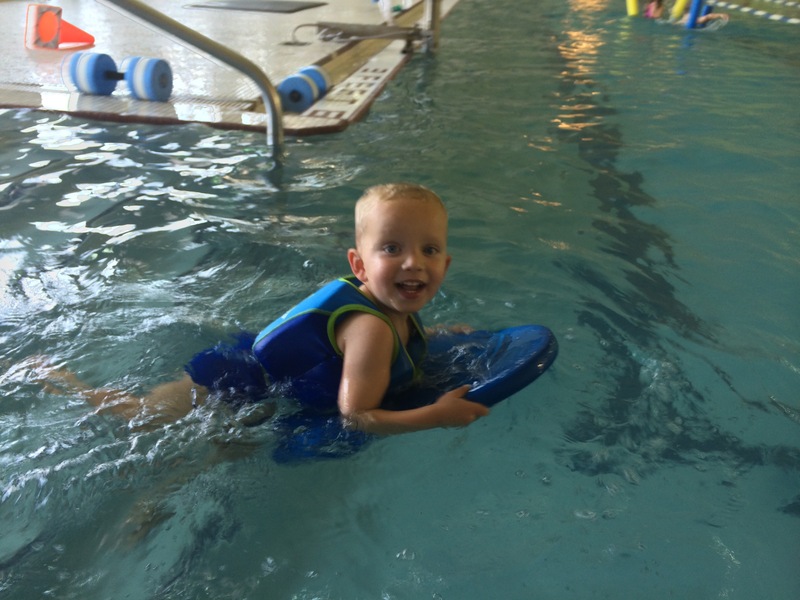 Faith asked if we could go swimming at the Y one afternoon. I was very tempted to say no because I don’t like to go to the pool, especially in the winter. But, I agreed, packed up our stuff and headed to the Y. It was such fun! The four of us swam in the pool for over an hour. I really enjoyed spending that time with them and would go back to do it again. 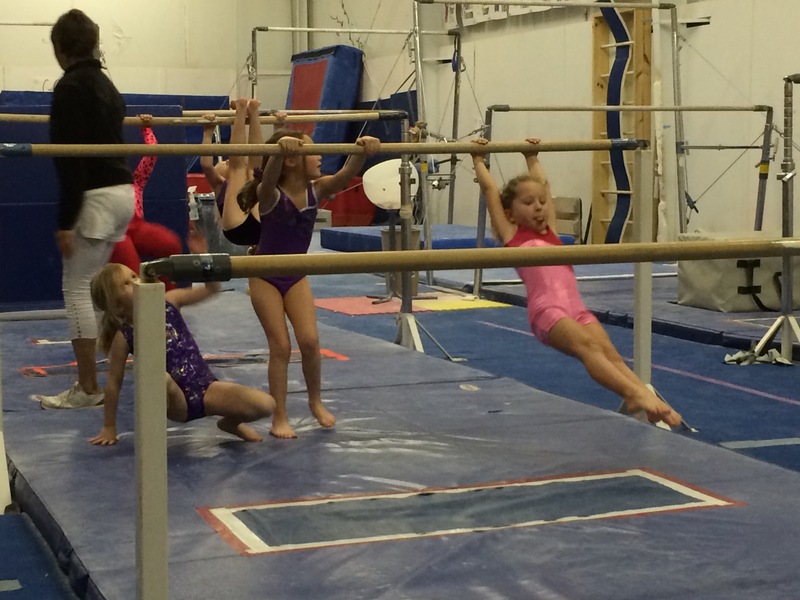 So glad that I stepped out of my comfort zone to do something fun with the kids. I am sure that I have many more examples of saying yes when I want to say no. “Can we take the cushions off the couch?” is one I hear quite often. :). Sometimes I really have to weigh the costs before I answer their requests. I ask myself “would it be so bad to say “yes” right now?” If it doesn’t require me to do too much extra work, involve sweets, or put the kids in danger then the answer is probably “yes”. This entry was posted in Uncategorized and tagged no, yes on December 27, 2014 by Becca. -Tom’s dad arrived Friday and stayed for the week. -Tom and I decided to demo our master bath and have a friend re-tile the floor and shower while we are in Pennsylvania. We have been tearing about the bathroom for days and it is finally down to the studs. I can’t wait to see how gorgeous my new bathroom is going to be. Don’t worry….there will be a blog post about it. -Tom and I served/deinered at the Lovefeast on Christmas Eve at Little Church. 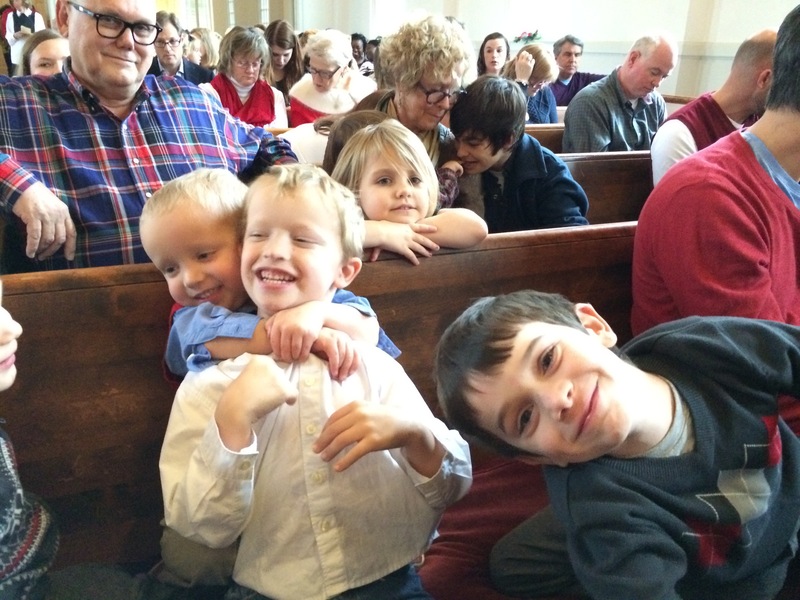 Faith and Wilson got to be Mary and Joseph in the church play during the children’s Christmas Eve service…. 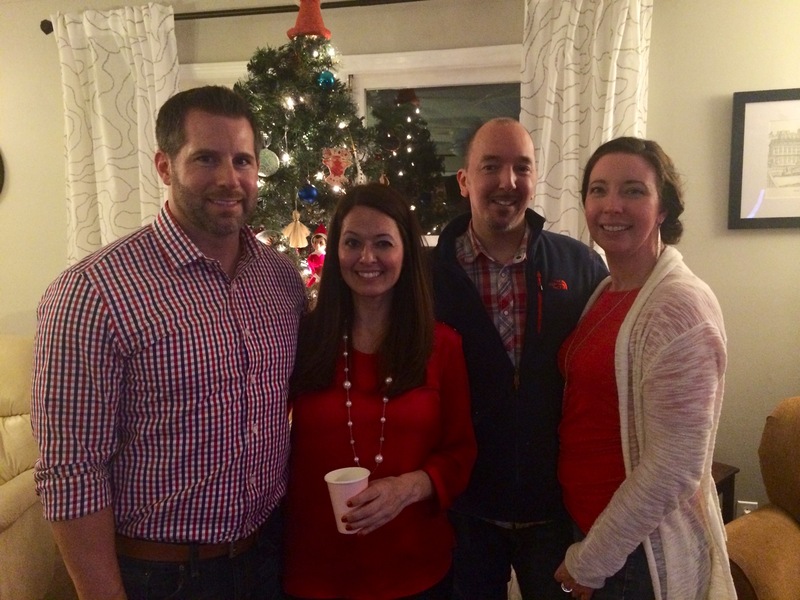 -Doug, Jacqueline, Gabriel and Shepherd drove down to Charlotte to spend Christmas with us. The kids were all very excited to be together once again. 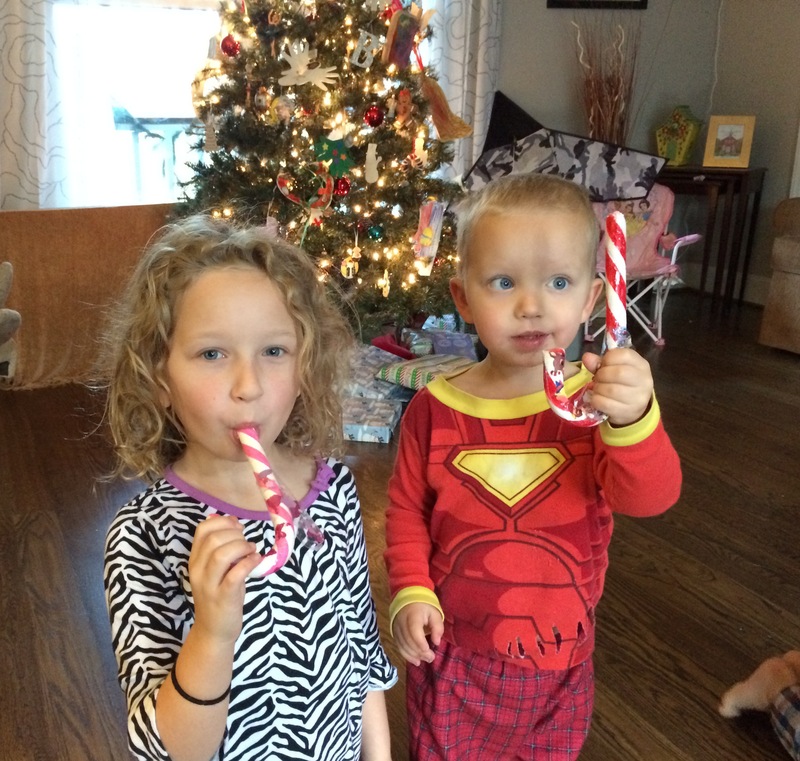 The kids opened up their gifts on Christmas morning. We give them each three gifts and a stocking. Jesus got three gifts and so will they. Wilson’s big gift was a new scooter, since he was always riding Faith’s pink one. Miller picked out his own gifts this year and then helped me wrap them. It was great! He is so hard to shop for since he doesn’t really play with too many toys. Miller liked the candy in his stocking the best. He ate all of it right away. 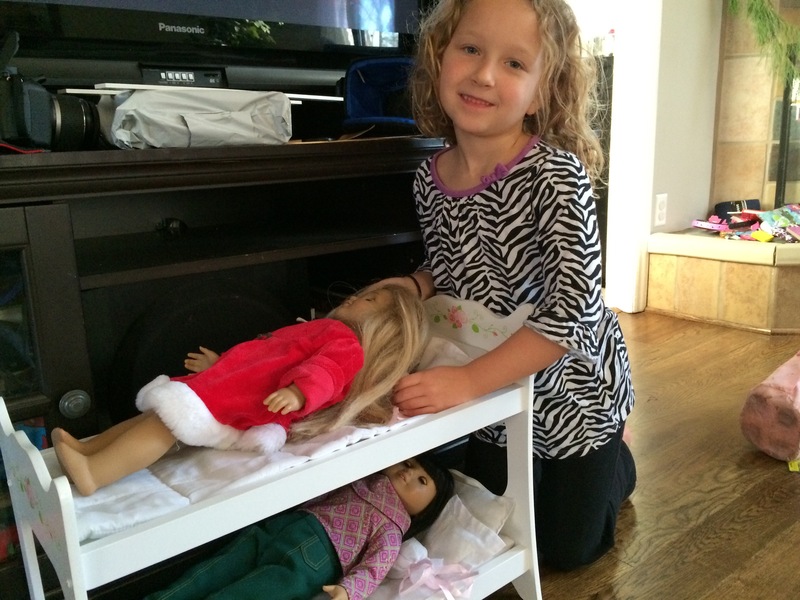 -Faith got lots of American Girl Doll items for Christmas. I have had a doll that was given to me years ago stored away for her. Unfortunately, it wasn’t the doll she wanted. I have known for weeks that this wasn’t the one she wanted but was hoping that it wouldn’t matter once she opened the doll….wrong. Now I am going to sell Ivy (the one on the bottom bunk) and buy the one she wants, Rebecca. 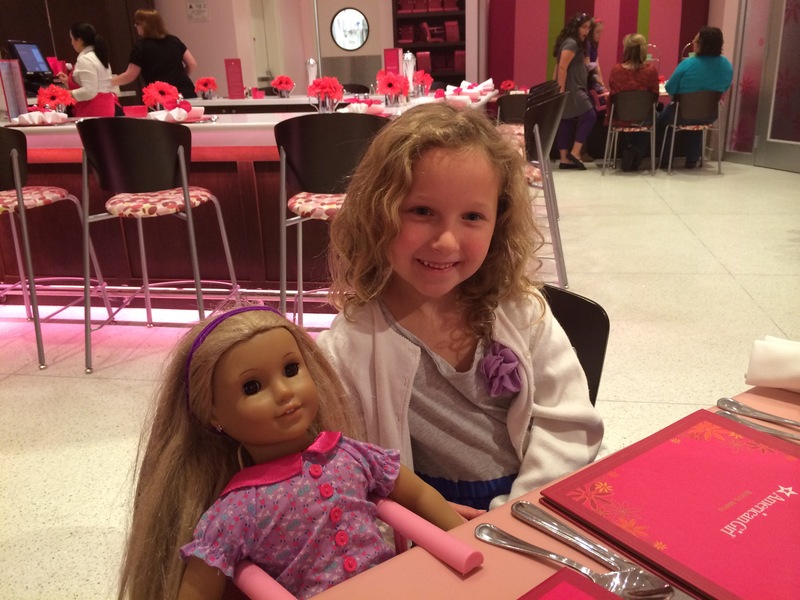 Tomorrow we will be going to the store to get the one she wants – it is Christmas and I want to give her the gift of an American Girl doll that she gets to pick out herself. Amazingly enough, I put the Ivy doll on Craigslist and eight hours later it was sold. I love how the Lord just works out all of the details…. We went to my parent’s house for a steak dinner tonight. It was delicious and it rounded out the day perfectly. Christmas is a time for being with loved ones and being thankful for all that the Lord has given us, especially His Son, Jesus. 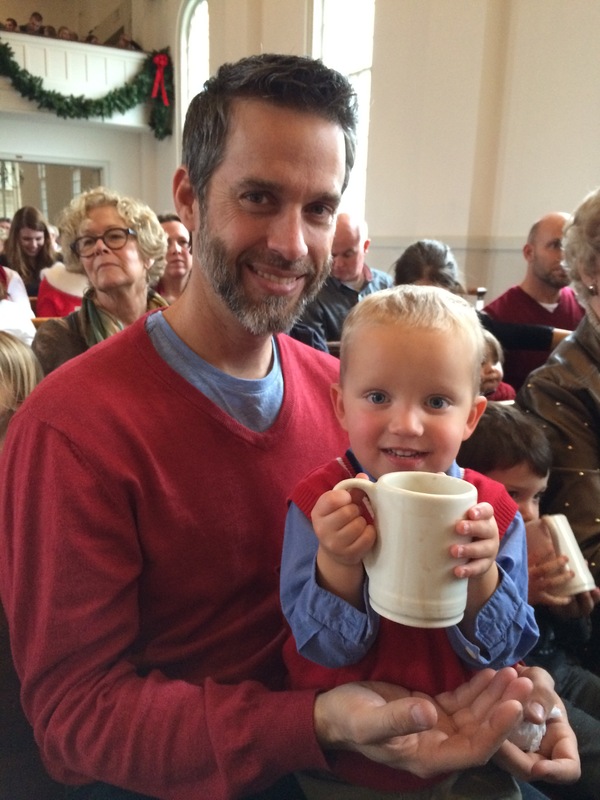 It is hard to stay focused on what is really important at Christmas time – Jesus’s birthday, but we did it. 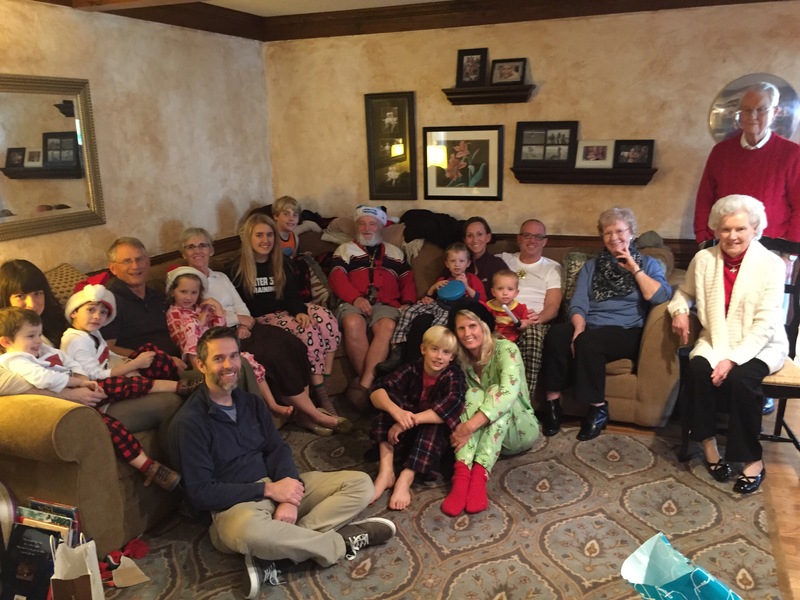 Yes, we opened gifts, but they were secondary to the fun that we had together as a family. I am thankful everyday for the many, many blessings that have been given to me and my family. Happy Birthday, Jesus! 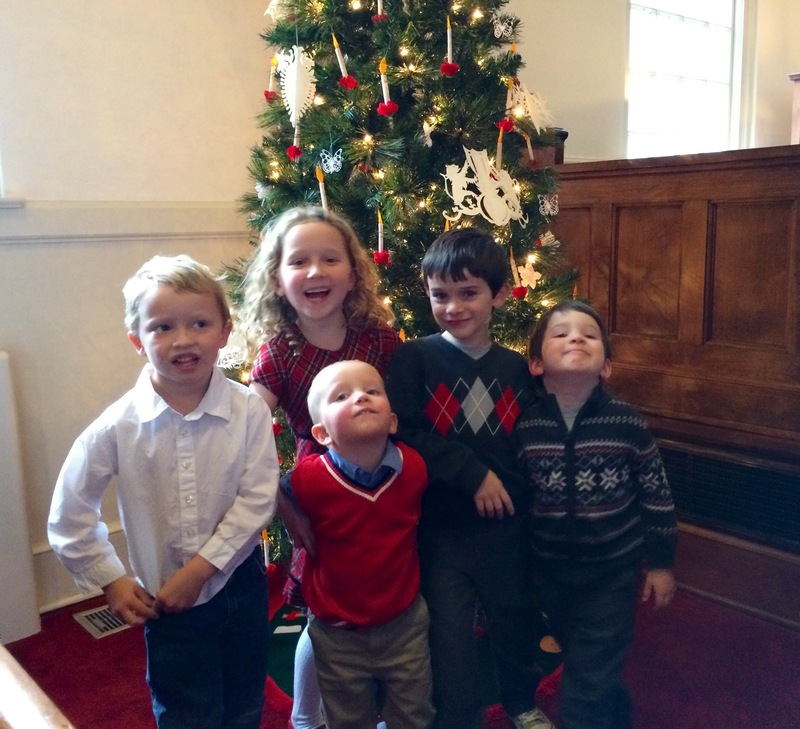 This entry was posted in Uncategorized and tagged christmas, pennsylvania on December 25, 2014 by Becca. 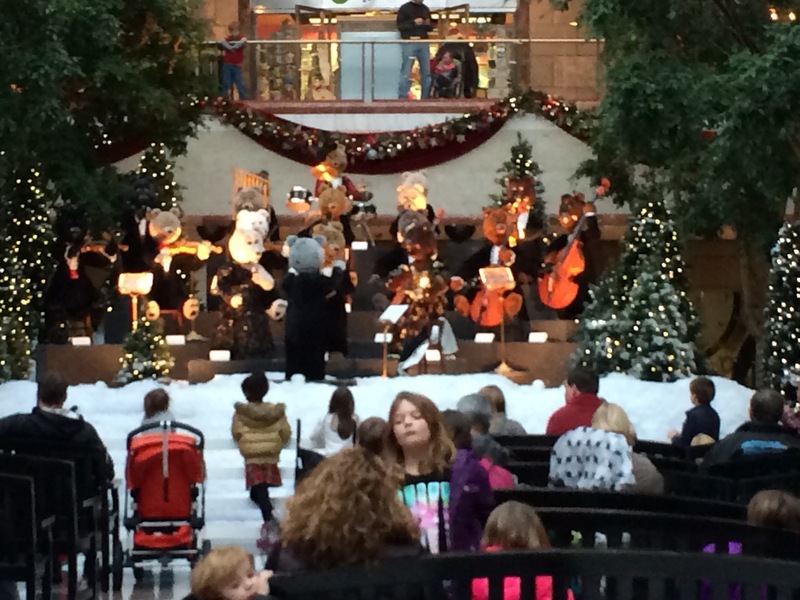 Today we went to see the singing Christmas bears uptown. The bears are very slow moving animatronical bears that sing Christmas songs. We have been going to see them for years. The kids have been talking about going to see them all month, but after we got there the kids were not interested at all. We watched the bears for a bit and then the kids were off to ride the escalators. There are three sets of escalators in this one large area and it is too much for little kids to resist. They had more fun doing this…. I, however, had the most fun doing this…. 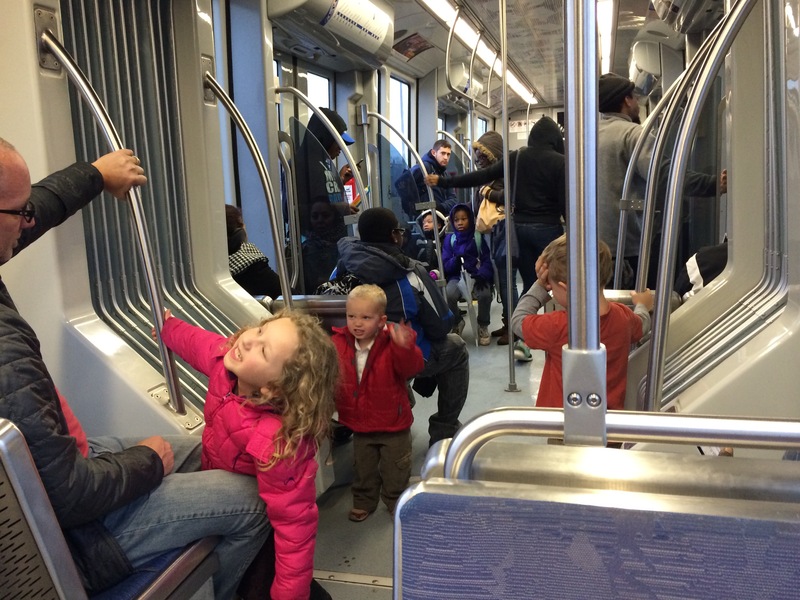 As tradition has set in place, we take the Lynx (Light Rail) uptown. It takes just as long to drive to the train’s Park and Ride lot as it would if we just drove uptown, but then we wouldn’t have the fun of riding the train. 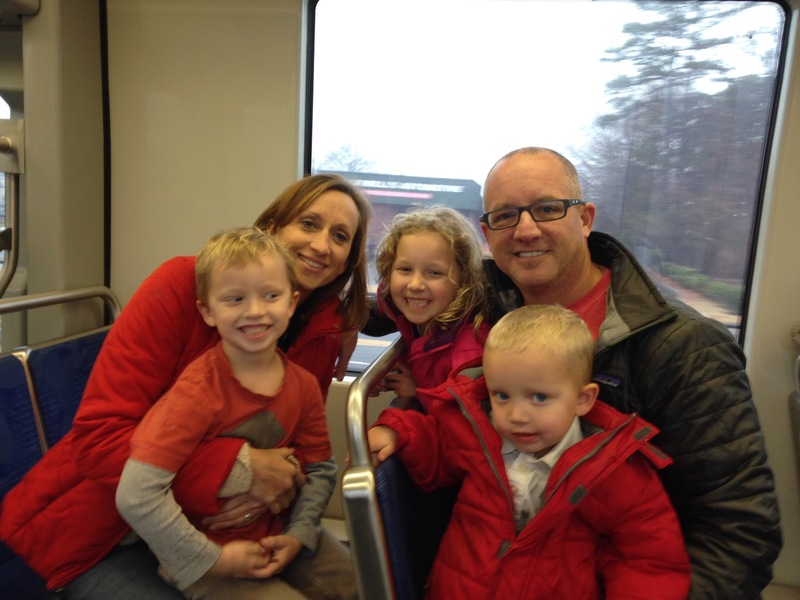 The picture says it all…yes, we were the loudest people on the train. I am not sure if we will go see the bears again next year. We probably will, but only for the other superfluous things that go along with the bears, like the train, escalators, drinks and peanuts, and a visit to “the big city”. This entry was posted in Uncategorized and tagged bears, christmas, train, uptown on December 23, 2014 by Becca. 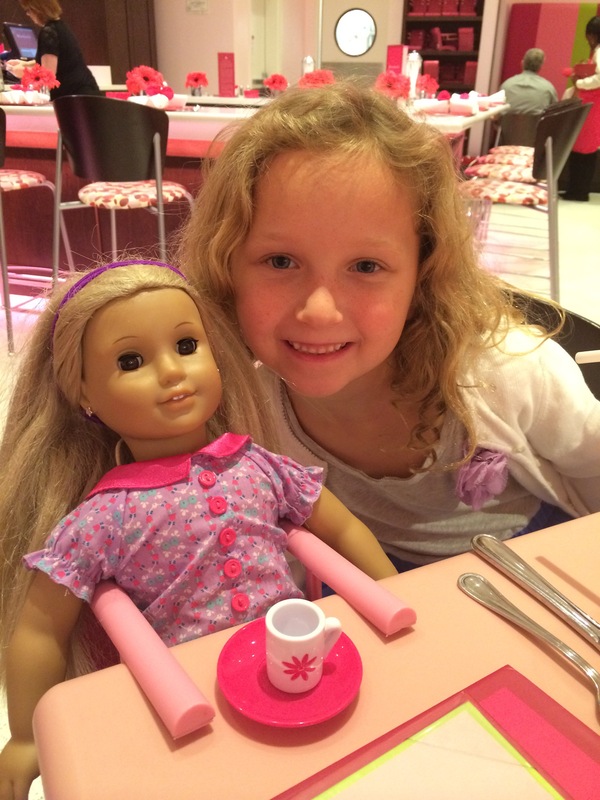 Faith and her American Girl Doll Julie have been inseparable for months. They sleep together, eat together, Faith gets her dressed in the morning and puts on her pjs at night. It is really cute (and sometimes inconvenient). 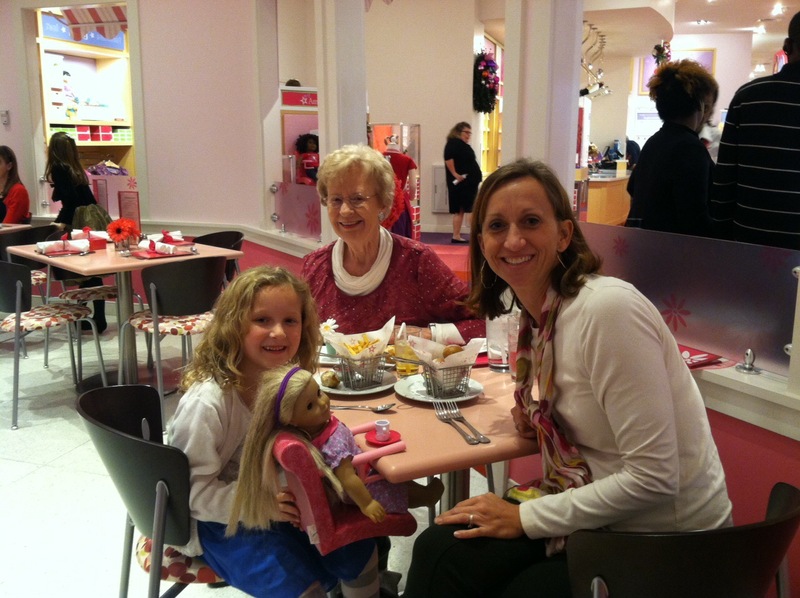 She has been asking to go to the American Girl doll store here in Charlotte so that Julie could get her ears pierced. Yes, a doll can get its ears pierced for $14 at the store and it comes with a pack of earrings. Not bad pricing for the American Girl store. :). 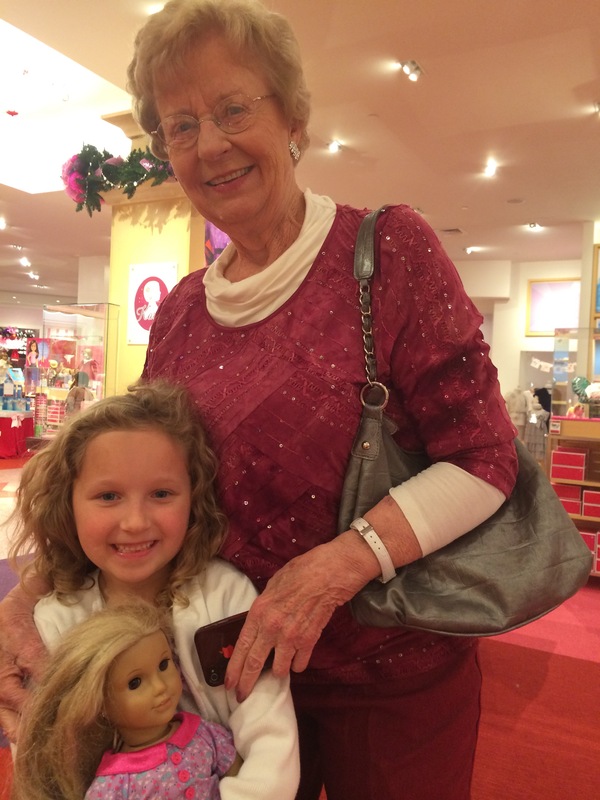 As a Christmas gift, Grandmama Pat said she would take Faith to the store to browse, get the dolls ears pierced and eat with her at the cafe. Faith was so excited! She waited over a week for the special day to arrive and was giddy with excitement. The first item on the list was Julie’s ears. They took Julie in the back and drilled holes for the earrings (of course faith doesn’t know that is what they did). This store has thought of everything! They have an entire salon of services for these expensive dolls. Thankfully, we were able to purchase her Julie doll for a small donation to the church. That is where her second Christmas present doll came from as well. The dolls are typically $135 each. The next event on our agenda was to eat at the cafe. The three of us got a chair at the table and Julie was given a baby seat that attached to the table. Julie also got her own cup and saucer that she could take home. The meal was surprisingly delicious and not too overpriced. The servings were small, but we were eating in a restaurant geared towards children and dolls. We had fruit and yogurt, French fries, and soft pretzel bites as the meal and then ice cream for dessert. After we ate, faith walked around the store and pointed to everything that she wanted in the store….which was just about everything there. Grandmama, Faith and I had a delightful afternoon together and Faith got exactly what she wanted for one of her Christmas presents. 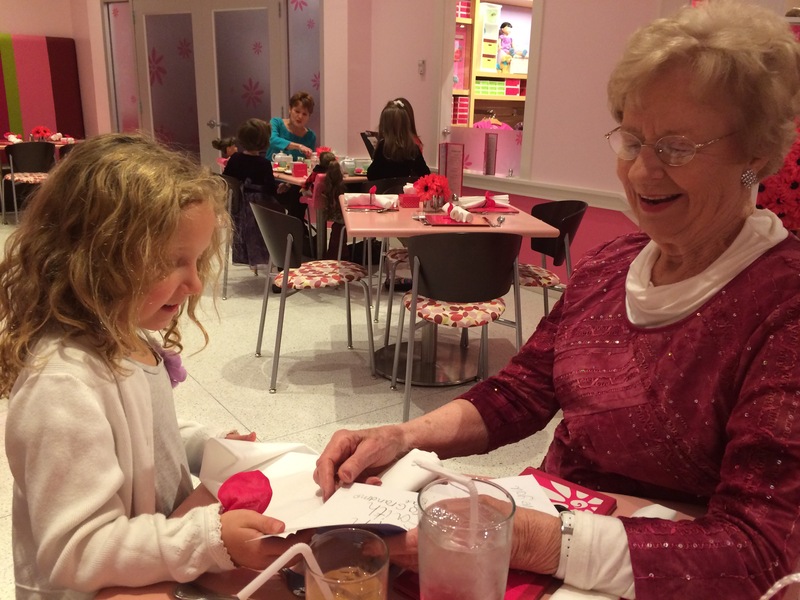 This entry was posted in Uncategorized and tagged american, doll, Faith, girl, grandmama, pat on December 19, 2014 by Becca. Life is busy. Even when I have some down time at home I seem to be doing something that needs to be done. It can get very mundane and weighty. In those times, I need to remember the things that bring me joy and make me smile. 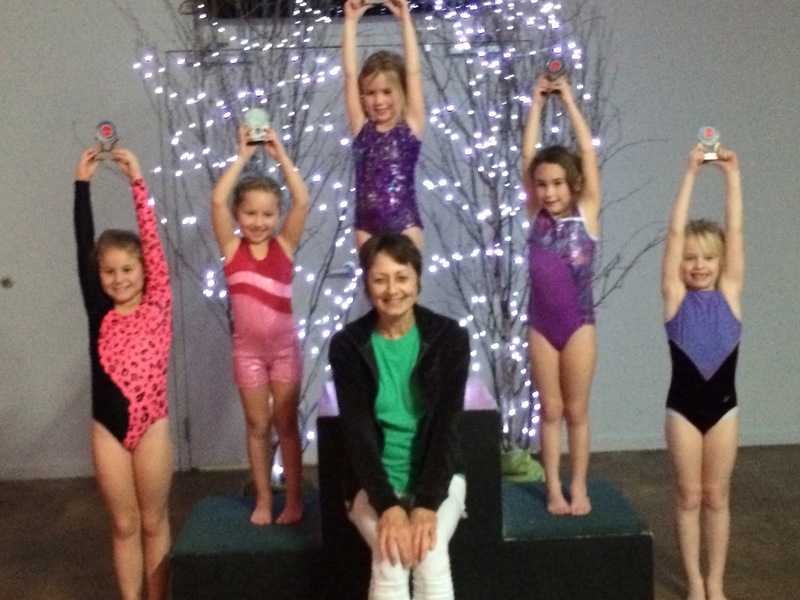 Here are just a few…. 1. Laughing at work with Yolanda about the simplest things. Somedays I don’t even feel like I went to work. Yolanda and I laugh non-stop throughout the day. Most of the time we are laughing at ourselves. We are so similar that it is scary….even crazier that our birthdays are two days apart. 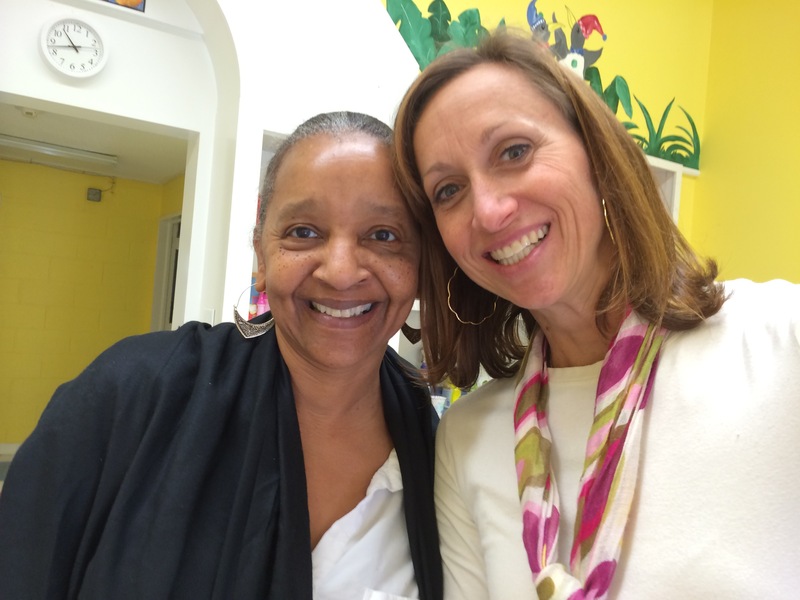 Teaching at the preschool with Yolanda brings me joy. 2. 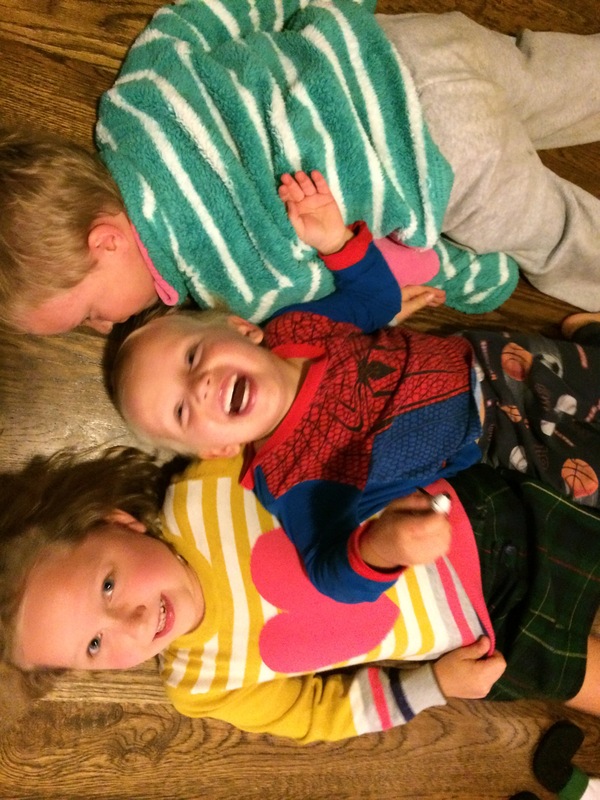 Hearing my three children laughing and playing together definitely brings me joy. They love each other and enjoy each others’ company. It puts a smile on my face to hear them laughing together in the other room. 3. 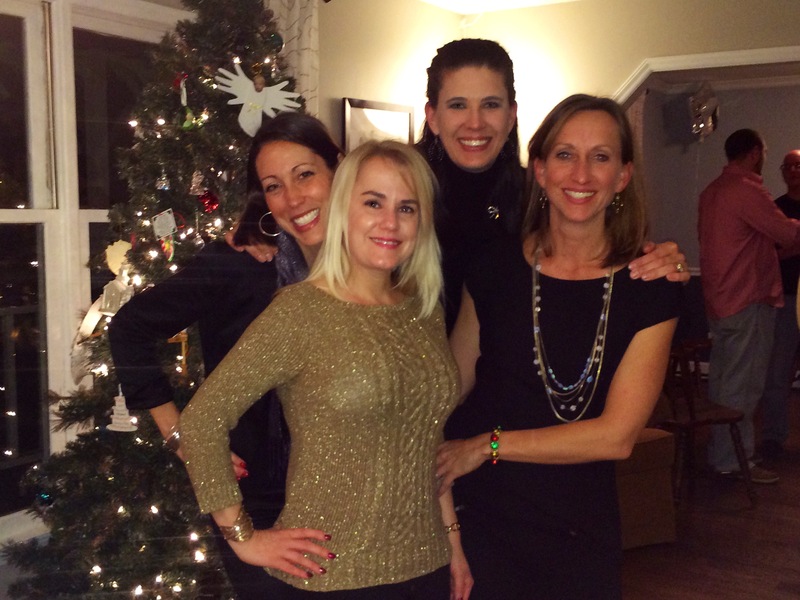 Going out with my girlfriends brings me joy. I have the greatest girl friends. They are all women that I can be completely honest and open with and know that I will not be judged. We all have different strengths and personalities, but we love each other just the same. Of course our favorite place to go is the Comedy Zone in Uptown Charlotte. Here is Michaleh, Ashley, Sidney and I with the headliner of the night, Greg Morton. He was hilarious and very talented. 4. We have movie night every Friday and Saturday night. On Friday night we typically watch Survivor (Miller calls it “Challenge”) and Saturday is a kids movie of some sort. I love sitting on the couch with Tom and the kids, eating popcorn and having nothing to do but enjoy their company. Spending those hours on the couch with Tom and the kids definitely brings me joy. 5. For the last 6-8 weeks, I have made the commitment to go to the Cardio Funk exercise class that I enjoy. The class is near the church so after church Tom takes the kids home while I hang out for an hour, relax, and then go to my class. This class reminds me that I am still fun, young, not so out of touch and that I can still shake my money maker! The saying “It’s the little things in life…” did not become popular for no reason at all. People say it because it is true! I know that I have inner joy all of the time, but certain things in life give us greater joy in the moment. These are the things that bring me joy on a regular basis and I am thankful for them and those that create the memories with me. This entry was posted in Uncategorized and tagged joy on December 17, 2014 by Becca. I do not like to grow older every year. I dread the coming of another birthday because with it comes more wrinkles and the admission that I am not spring chicken anymore. It also reminds that time keeps flying by, no matter how badly I want to slow it down. This is why I instituted the ritual of throwing a Christmas/birthday party at our house every year. My philosophy is this: getting older is a lot more fun when I have a party to go to. This year was no exception! Saturday night we had 24 of our closest friends come over to our house to celebrate and have a good time together. Thankfully, I know how to throw a low maintenance party and that has plenty of snacks, alcohol and friends. The food table was full of hummus, veggies, cheese and crackers, olives, mixed nuts, and pigs in a blanket (the latest food addition that was a huge success). I typically buy only 6 bottles of wine because I know that nearly everyone that walks in the door will bringing a bottle of wine with them. It is almost guaranteed that I will have more wine left over than I started with….not a bad thing to have happen. It has also become a ritual to play the charades game that we played last year. It is a hilarious game that involves everyone at the party, and you have to pay attention in order to do well. Sidney is the designated game master. Here is Megan acting out one of the names she drew out of the hat…. Last year I forgot to take pictures so this time I took some early in the night before I forgot. 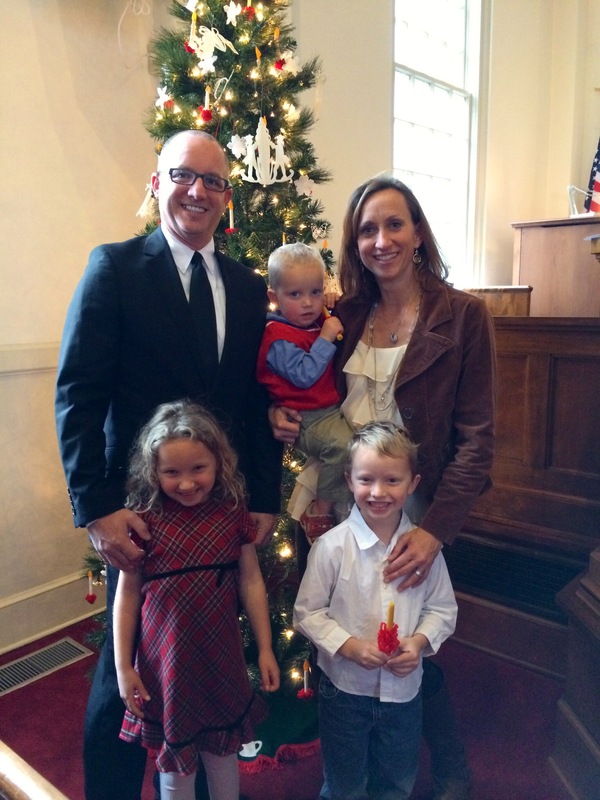 This is Damian and Mandy DiFilippo and Josh and Kristee Bostick. Mandy finally made it to a party. Kristee was thoughtful enough to bring a bottle of the party’s favorite vodka (another tradition). 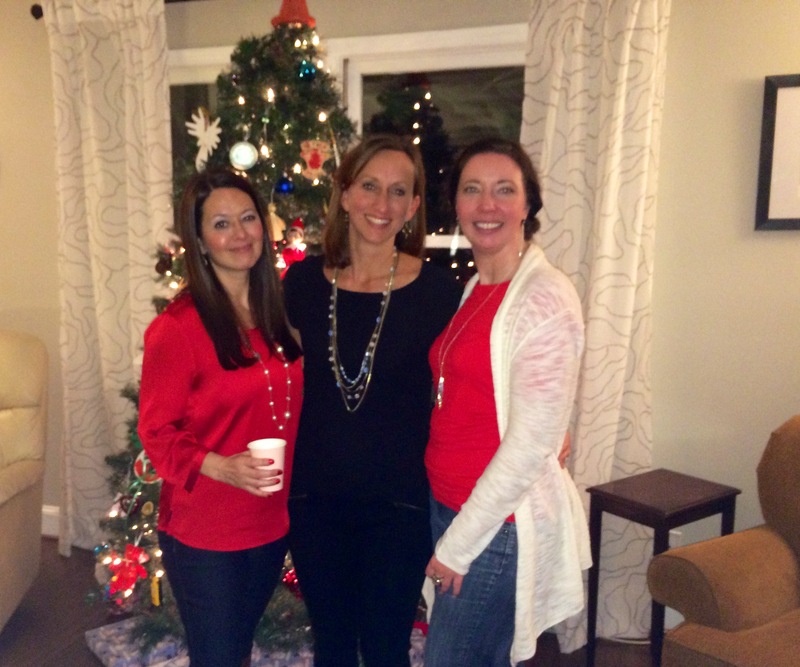 Mandy, Me and Kristee …. Michelle and Joe McCready. 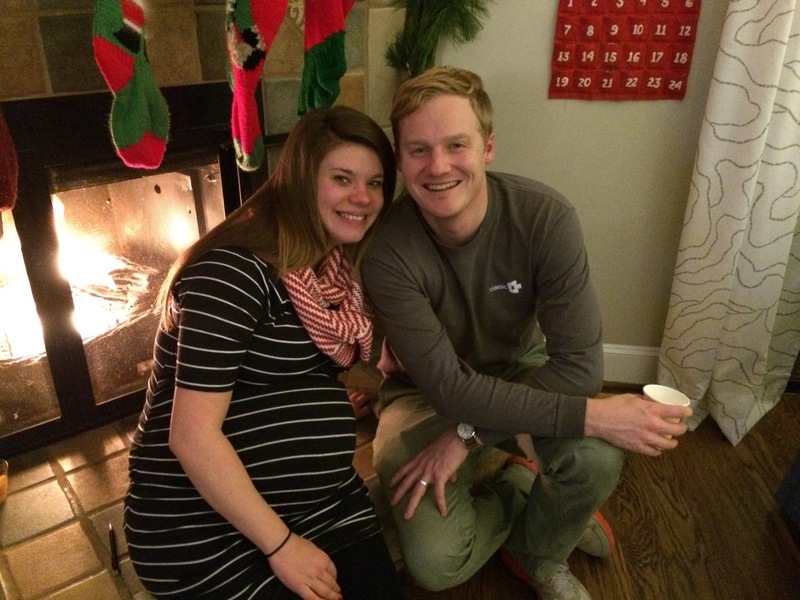 I am lucky that they even showed up….she is over due with baby number one. I felt very loved and joyful Saturday night. 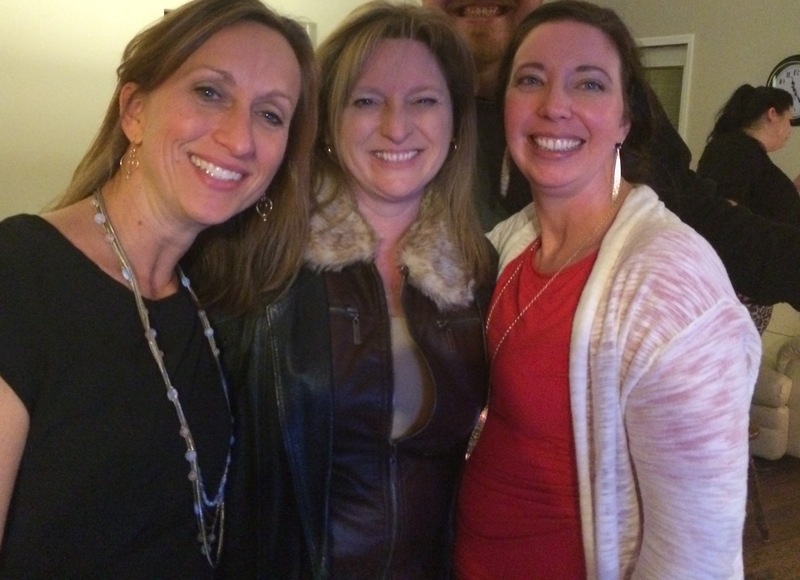 I had fun and celebrated with my friends from many different circles: church, neighborhood, school, and the gym. Sidney’s comment was, “Wow, you guys know a lot of people.” We do, and I love everyone one of them and am so glad that they took the time to come and enjoy the night with us. Until next year…. This entry was posted in Uncategorized and tagged 42, Becca, birthday, party on December 15, 2014 by Becca. I have a tendency to over-book myself and my calendar. Some days I have only one thing to do, while other days have items overlapping. Not all the things are my calendar are work, but having too many fun things on my calendar can be exhausting as well. Thursday was one of those busy, but good, days. I started out the day by visiting my good friend, Dr. Smith, the plastic surgeon. It wasn’t for anything major, it was to discuss a scar that I have had for almost thirty years. It is a small scar, but in a terrible location….right in between my eyes. I got it in seventh grade while playing on my friend, Rhonda’s, piano. I could never really see the scar until this past year. It started to be visible in every picture that I took. I hated it. I went to see if Dr. Smith could make it disappear…he did. He is the nicest doctor I have ever been to see. He said, “You know, I think I have some extra filler back there that we can use. I will just plump it up a bit and you won’t be able to see it anymore.” Yep, thats right…free filler!! It puffed up the skin so that the scar no longer cast a shadow and it literally looked like it disappeared. Brilliant!! I don’t have any plans to be a plastic surgery junky, but it is nice to be able to get rid of the things that really bother me every once in a while. A nice birthday gift! After my very successful trip to the doctor, Miller and I went to my friend Julia’s house for a playdate. Her son, Hudson, is a few months older than Miller and they play very well together. We were there about two hours, when I realized that I needed to go home and have some down time before I went to get Wilson and then go to another playdate at 2:00pm. A twenty minute power nap does wonders for my sanity and physical well-being. I am an extravert for about 2-3 hours and then I run out of extraverted-ness. It is like I use it up all at once and then there is nothing left. If I didn’t leave right then to get a bit of quiet time then I would not be able to complete the busy day ahead. It was nice to go home and cuddle up on the couch with Miller for a little while. Our second playdate was with my friend, Sarah, down the street. Wilson loves to play with her rough-and-tumble boys. They also have an amazing backyard to run around in. Believe it or not, but the day is STILL NOT OVER! Tom had his employee Christmas party that night. My wonderful parents let the kids sleep over so that we could go out for the night. :). We went to VBGB for dinner and drinks. VGBG is a beer garden near uptown Charlotte that has a big heated patio with ping pong tables and other games. I was a bit grumpy on the way there which resulted in Tom telling me, “I need ‘Fun Becca’ to come out so that we can have a good time tonight”. I took that to heart, and ‘Fun Becca’ made a smashing appearance. We talked and hung out with three other couples. One of the other wives and I really hit it off. I love it when I can go out, have a few drinks, relax AND meet people that I really enjoy spending time with. We had a fun time at the party and I can actually look forward to more business events. 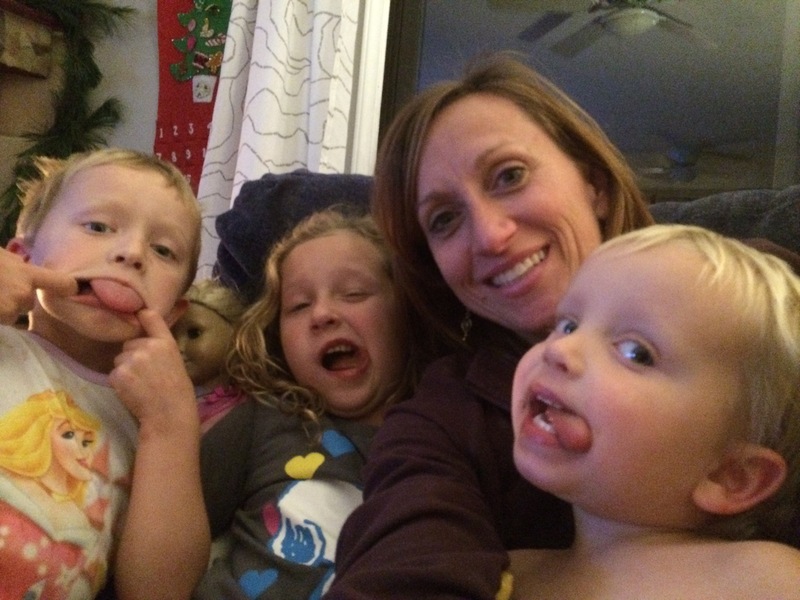 I know that I told you a lot of unless information in this post, but part of me wants to remember how busy life is with three kids, a husband, and an overly social me. I enjoy meeting new people and doing things with friends. I couldn’t have a day as busy as this one all of the time, but once in a while it is fun. I stayed out of the house all day long, cleaned absolutely nothing, spent time with the kids, watched Faith show her stuff, eat a delicious/free meal, and have some fun with my husband. What could be better?!? 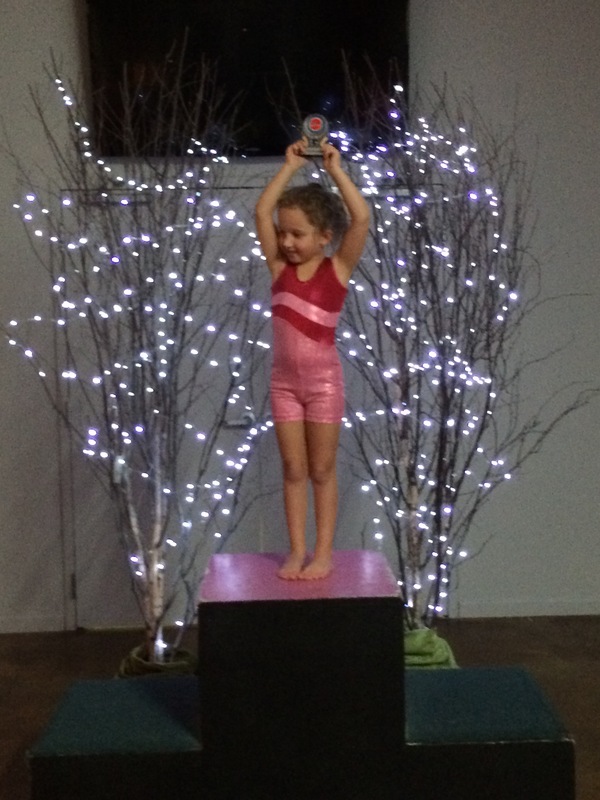 This entry was posted in Uncategorized and tagged Faith, gymnastics, \ on December 13, 2014 by Becca.